In 1993, a solid Gold Medal, ‘The Edgar Palamountain Award for Excellence‘, was instituted in memory of Edgar Palamountain, Chairman of the Council at Buckingham from 1979 to 1984. 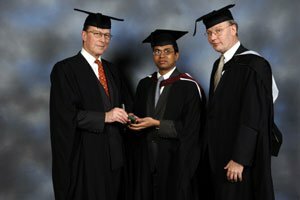 The award is given every year to the undergraduate who is judged ‘first among equals’. “Winning the Edgar Palamountain Award for Excellence was a fantastic way to end an incredible experience at Buckingham University. When I began my course of Law and Politics in January 2005, I was not sure what to expect from Buckingham, however it became clear in a matter of weeks that the quality and structure of the teaching would unlock my full academic potential. I also found that, while small, the student base was so diverse that I made strong friendships with students from all over the world, which have continued long after leaving Buckingham. The fact that I enjoyed my life in Buckingham so much was the reason why I was able to keep my academic performance at such a good level. 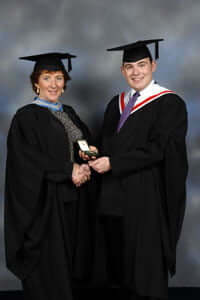 In 2005, a solid Gold Medal, ‘The Dame Barbara Shenfield Award‘, was instituted in memory of Dame Barbara Shenfield, a founder member of the University’s Council. The award will be made annually to the postgraduate who is judged to have achieved the best overall performance of the year.